Prof. Jessica Warren’s lab in the Department of Geological Sciences at the University of Delaware studies the geochemistry and rheology of the Earth’s mantle, using peridotites collected on land and at sea. Peridotite is the dominant lithology of the upper mantle, consisting of olivine, orthopyroxene and clinopyroxene, with minor amounts of spinel and sulfide. In the oceans, peridotites are collected by dredging, diving or drilling, while on land they are found as xenoliths and uplifted massifs. The Mantle Processes group uses peridotites to study mantle dynamics, deformation, and evolution by integrating geochemical, petrological, rheological, and structural methods. 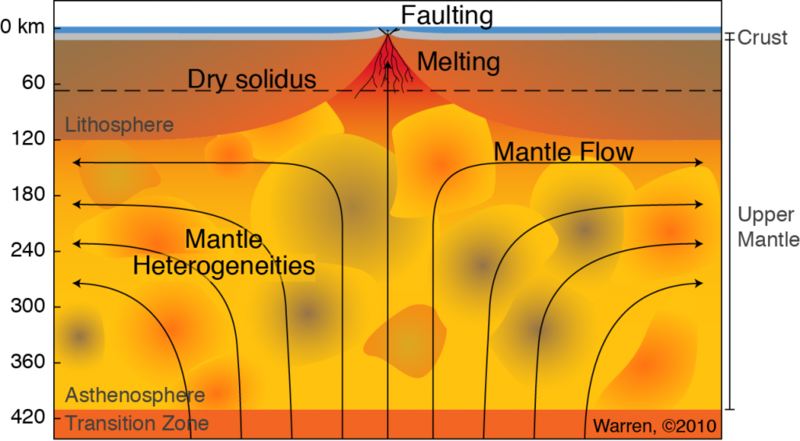 In particular, the group focuses on two themes: (i) constraining mantle composition and evolution and (ii) under- standing mantle flow and shear localization. Undergraduates: projects are available in the lab during the academic year or summer. Graduate students: a position is available for Fall 2019. Postdocs: I am always interested to hear from prospective postdocs with similar research interests. Position availability is dependent on funding, but I am happy to discuss possible projects and explore funding opportunities!